I must be the only person in the world who can stretch out her birthday celebration over a span of 15 days! To be fair, this trip to Soba wasn't intended to be an actual birthday celebration. That I did in fabulous style a couple weekends ago, during Pittsburgh Restaurant Week, at Bite Bistro. But when the Big Burrito Group considers you a VIP...actually, all you have to do is sign up for the email newsletters...you get a little birthday gift from them in the form of an entree (up to $30) at one of their restaurants (except Umi). A Big Burrito Happy Birthday! It is brilliant, actually. There were a couple of Big Burrito restaurants I still hadn't tried, and it would probably have taken me a whole lot longer to make it out to one of them if it weren't for this little reminder. With my having been out of town, however, I wasn't even sure I could make it out, but I finally found the opportunity to redeem my gift on practically the last possible valid date. I decided on Soba as I had only been there for drinks but not for dinner, and I was curious to check out their food. As the name would imply, Soba's menu is Asian-inspired, with dishes featuring ingredients from such exotic lands as Thailand, Korea, and China. I was very tempted by a number of the entree options - the Miso Black Cod, Duck Breast and Braised Leg, Tandoori Grilled Salmon, and the Red Curry Tofu were part of the Top 5 - but in the end I went with the Seared Rare Tuna. 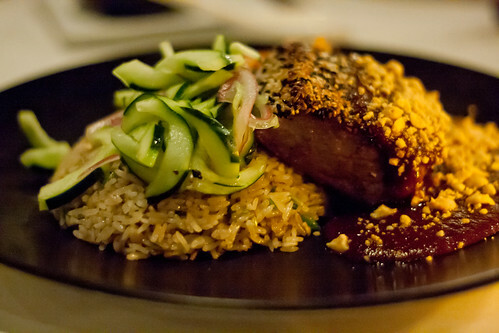 The Seared Rare Tuna is covered in a sesame-peanut crust, served with ginger fried rice, a cucumber and red onion salad, and kim chi, which is hidden behind the tuna in the photo. The sauce is a Korean BBQ sauce, which was the main reason I chose this. The rare tuna-Korean BBQ sauce combo was good, and certainly interesting if nothing else. I had hoped for a more sweet grilled bulgogi-like flavor in the BBQ sauce, however, as that's the image I have when I think of Korean BBQ, but this was not so. Then again, you don't go to a Big Burrito restaurant expecting authentic ethnic food, so I'm OK with that. I frankly didn't eat too much of the side items as I was getting full (and saving room for dessert) - I had assumed a seafood dish would be somewhat lighter than a heavy-meaty dish, but I was very wrong. The tuna was a pretty hefty number. Speaking of dessert...it was a tough choice there as well. Literally everything sounded amazing. In the end, I chose the Soba Banana Split for one reason: the pandan ice cream. I had never heard of pandan before, but thanks to mobile technology I was able to find out that it is a plant grown in tropical Asian countries and goes well with coconut milk. I love coconut, so I deduced that anything that goes well with it must be good, too. Besides, where else are you gonna get pandan ice cream?? As it turns out, the pandan ice cream was indeed the highlight of this dessert. 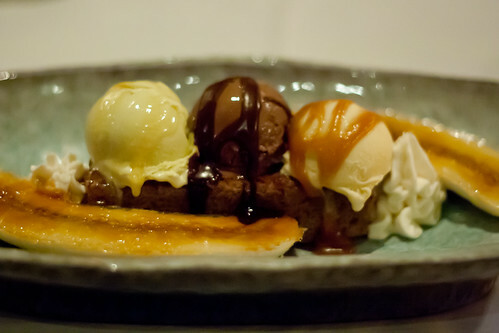 Not to diminish the rest of this lovely banana split, which also featured chocolate and sesame ice creams on top of a banana cake as well as caramelized bananas - but the pandan ice cream was chock full of sweet nutty flavor and complimented the the banana cake like nothing else. Actually, when I had my first bite of the pandan ice cream with the cake together, I had thought it was the cake that was emanating the amazing flavor, but turns out it was actually the ice cream. So good on its own; so good together with the cake. I mean, it was chocolate in the form of a maki roll - too cute to pass up the photo op! 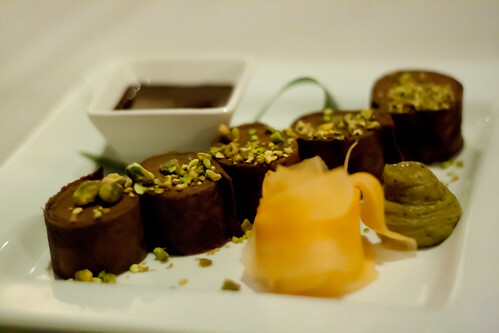 To be more specific, this dessert consists of a dark chocolate mousse rolled with chocolate pistachio crepe and topped with pistachio, served with pistachio cream (instead of wasabi), like chocolate sauce (instead of soy sauce), and shaved cantaloupe (instead of ginger). Cutest dessert, like, evar. By all accounts, the Chocolate Maki was delicious as well. My friends also gave thumbs up to their appetizers and entrees, which included a chopped salad, Thai corn chowder, and the Red Curry Tofu. And with that, Birthday 2012 is officially over. 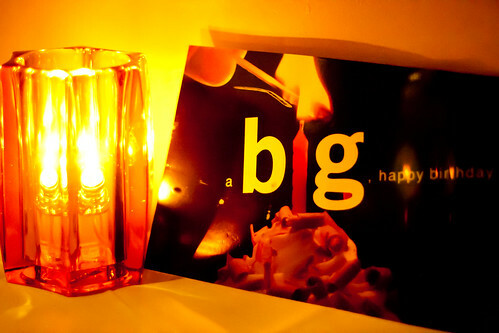 Thank you for the chance to dine at your restaurant, Big Burrito!